Initiating its first action in the multi-crore Stock Guru scam, the Enforcement Directorate (ED) has issued attachment orders on properties worth Rs83 crore of main accused Ullas Prabhakar Khaire and his wife Raksha under anti-money laundering laws. The seized properties, spread in various parts of the country like Mumbai, Ratnagiri and Nagpur in Maharashtra, Hyderabad and other cities in Andhra Pradesh and few places in Haryana, include some ‘benami’ immovable assets that the couple had allegedly purchased on fake identities. The agency will soon issue prohibitory orders on these assets, including cash, jewellery and bank accounts, under the provisions of the Prevention of Money Laundering Act (PMLA). ED took the latest action after it recorded the statement of the duo, lodged in Tihar jail here in judicial custody, sometime back and went through the probe reports of other agencies in this regard. The agency’s action to attach these properties under PMLA is aimed at depriving the accused of the benefits of these assets which are alleged to have been created through the “proceeds of crime” and duping investors of their hard earned money. The sources said apart from the latest attachment orders, some more properties would soon be frozen under the same laws. The agency had registered a money laundering case against Ullas Prabhakar alias Lokeshwar Dev and his wife Raksha alias Priyanka Saraswat earlier this year after they were caught by Delhi Police. Acting in the same case, the Central Bureau of Investigation (CBI), had arrested Yogendra Mittal, an officer from the Indian Revenue Service (IRS) for allegedly receiving bribes from Khaire after raids were conducted by the I-T department against him some years back. The alleged perpetrators of Stock Guru scam—Ulhas Khaire and his wife Raksha—were arrested by Delhi Police’s Economic Offences Wing (EOW) in November 2012, nearly 22 months after dubious searches carried out by the Income Tax officer. 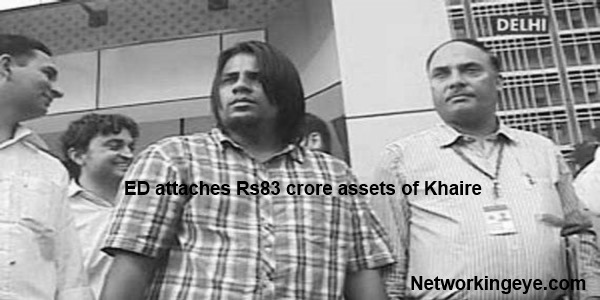 Khaire and Raksha were arrested for allegedly duping around two lakh investors from seven states of nearly Rs493 crore by promising them high returns on their investment through their firm Stock Guru dealing in shares. The couple had floated the firm in 2010 and allegedly lured people to invest in it promising highly lucrative returns of 20% per month followed by a subsequent refund of the principal amount in the seventh month, through source based investments in the share market. In January 2013, market regulator Securities and Exchange Board of India (SEBI) barred seven persons and and one company from the markets for ten years for their involvement in the Stock Guru fraud. The order follows a SEBI probe into complaints received by it regarding Khaire alias Lokeshwar Dev and his wife Raksha alias Priyanka Dev, both of whom used several aliases, fraudulently raising more than Rs1,500 crore through sale of preference shares of a company named SGI Research & Analysis. Names used by them included Ulhas Prabhakar Khaire and Raksha J Urs, Siddharth Jay and Maya Siddharth Marathe, Dr Raj and Priya Zaveri, Dr Rakesh Kumar and Prachi Maheshwari. A SEBI probe into the case found that the fraudsters had tricked the investors into putting in their money with a promise of 18% dividend, although the real assured dividend was a minuscule 0.12%. Besides, the money might have mostly been collected in cash to avoid any regulatory glare, as SGI’s bank account had entries for a total amount of just about Rs44 lakh towards subscription of its shares by 162 persons.